The Web Application Builder for Excel transforms Excel spreadsheet models into interactive web applications in ASP. NET, ASP Classic, JSP, and HTML. 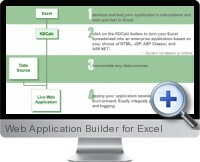 The Web Application Builder for Excel (KDCalc) can turn Excel spreadsheets into highly scalable enterprise applications. Highly scalable interactive calculation systems. Put the the Web Application Builder on your Application Server and use the XML integration to get all the benefits of load balancing, fail-over, and high availability. The Java version can integrate into EJB servers such as BEA's WebLogic, Apache Jakarta, Tomcat, and JBoss. The .NET version can be used on Windows2000 Server and Windows2003 servers with ASP.NET. The Web Application Builder for Excel has been adopted by banks, businesses, academic institutions, and governments all over the world. These organizations trust the Web Application Builder for Excel to accurately and securely process billions of dollars worth of transactions and business decisions every day. Trackable Many business processes now require an audit trail to comply with new regulations. The Web Application Builder for Excel lets you continue to rely on your trusted Excel spreadsheet models and enables you to centrally authenticate users, keep audit trails of business decisions, and log transactions. The Web Application Builder for Excel Engine for .NET is a 100% Managed .NET assembly DLL that works with .NET 1.0 or higher. The engine for Java is a 100% Pure Java component that works with Java 1.1.8 JRE or higher. The Web Application Builder for Excel Engines for Java and .NET can be used in any Java or .NET application and seamlessly integrate with any security architecture. Put Web Application Builder based applications on secure servers, behind firewalls, on intranets, etc. Use the Web Application Builder for Excel Process XML API for stateless server transactions through a single method call. This API lets you build custom web services around the Web Application Builder for Excel. The Web Application Builder for Excel generates complete Web apps that look and calculate like your Excel workbooks. But the builder is also component-oriented. If your application needs a custom user interface you can use any UI technology, including Flash, Director, or anything that can call Java or .NET. If you don't need any interface at all, you can integrate the Web Application Builder for Excel Engine to provide batch execution of your calculations and business rules. The Web Application Builder for Excel can handle huge spreadsheets. Customers use the Web Application Builder for Excel to compile Excel files that range from 500K to over 30MB, with over 100 Worksheets, and over 1 Million formula cells.